I’m very excited to show you guys this. Have a look! I have now finished my Scholarship with George Calombaris and his restaurants. I couldn’t be more grateful for my time and the many valuable experiences I had. Working in kitchens for over three months confirmed for me that food is something I want to pursue as a career. The question lots of people ask me now is what’s next for Callum? 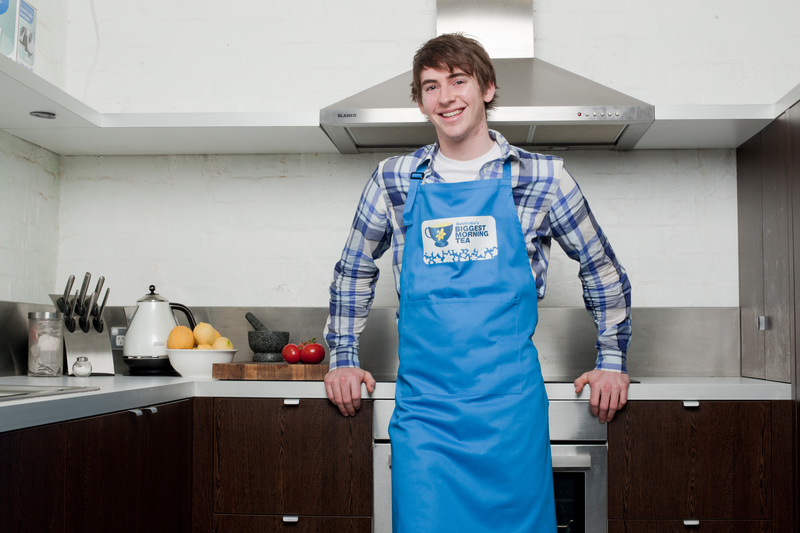 Since leaving The Press Club group recently I have been doing a few catering gigs, cooking demos and charity work. What I’m really about though is education about food. I have a fantastic opportunity during March and April to visit a group of university colleges, where I will spend time with the students that live on campus. I hope to teach them some basics in how to cook easy, healthy meals (on a uni student budget). I’m looking forward to the challenge- and as a former uni student myself, I have a few tips and tricks that I think will benefit the students. It gets my goat when people think cooking is too hard, time consuming or expensive. Seeing some of my own friends live largely on take away and pre-prepared meals, I want to try and help as many people as I can to understand what fresh cooking is all about. Wanting to help educate people does not necessarily mean that I’m turning my back on being a chef as a career. I feel though at this place and time I have some fantastic exposure from the Masterchef show which I can use to try and give something back. I’ll make sure I put some photos up once I start at the colleges, and some recipes to match. In the meantime I’ll be continuing to support fantastic charities like the cancer council, and do some demonstrations for example, the Natuzzi food and wine festival with my good mate Adam Liaw. 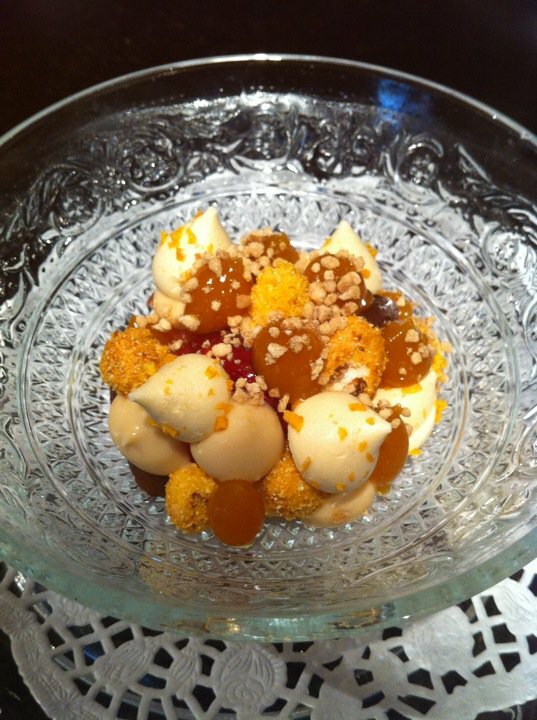 It has been some time since I have blogged; restaurants around this time of year can be pretty crazy! 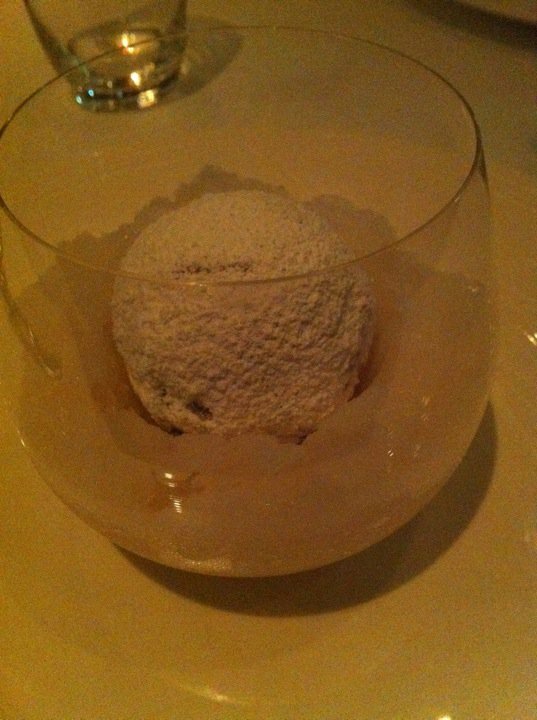 I have spent the last two weeks at a new restaurant in Melbourne, Philippe Mouchel’s PM24. Philippe has held a reputation for having some of the best classic French food in Melbourne. French food is one of my favourite cuisines, and so I was pretty eager to get started. One of the first things I noticed about the way Philippe (and head chef Sascha) ran a kitchen was how willing they were to give everyone in the kitchen a fair share of responsibility. 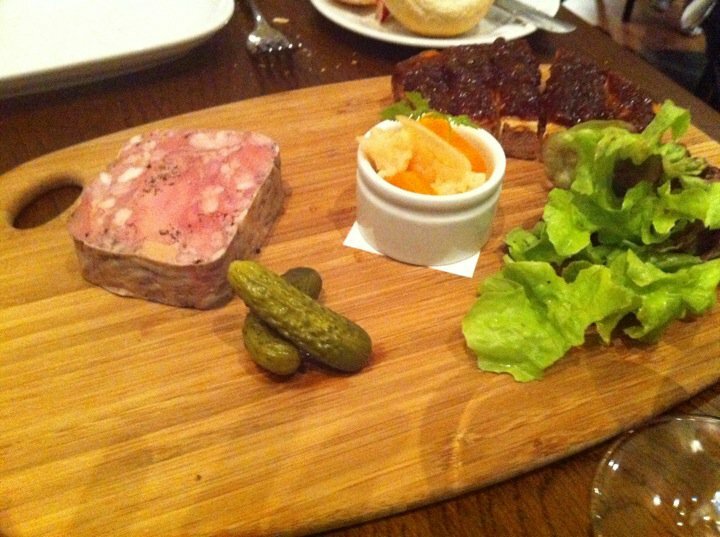 For example, making terrines is something that a Sous Chef or other experienced chef would make. Here some of the younger chefs were given the task. Pork and chicken liver terrine, pickled vegetables, cornichons, onion jam on toast. Another example was letting me work on the sauce section on my second week of working in the restaurant. Sauce section involves making stocks, sauces, cooking meat, and plating up main dishes, and is usually done by the more experienced chefs. I hadn’t made a terrine like the one above, and so I eagerly asked if I could do the first job required; clean the chicken livers. 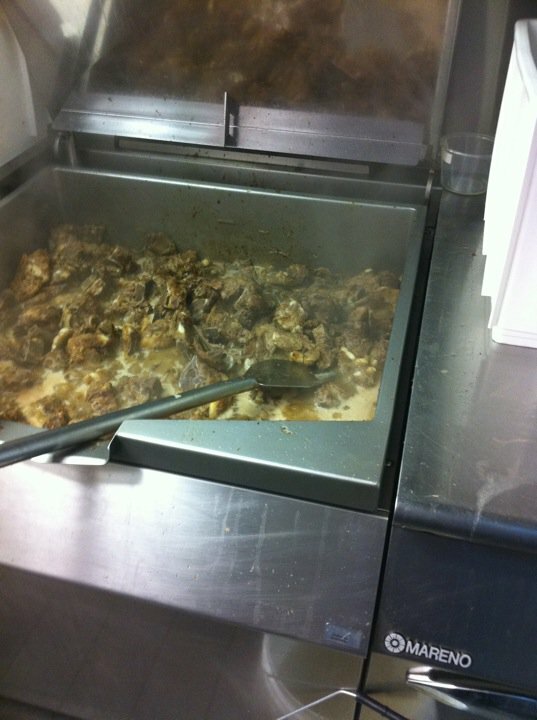 I think the chef thought I was a little insane, as there was 15kg of livers to be cleaned! I must admit my enthusiasm for the task waned as I battled my way through the enormous pile of livers. At least I’ll be pretty quick if I ever need to make chicken liver parfait or a terrine again! The centrepiece of the restaurant is certainly the rotisserie. Chicken, duck, pork and rack of lamb are all on the menu. 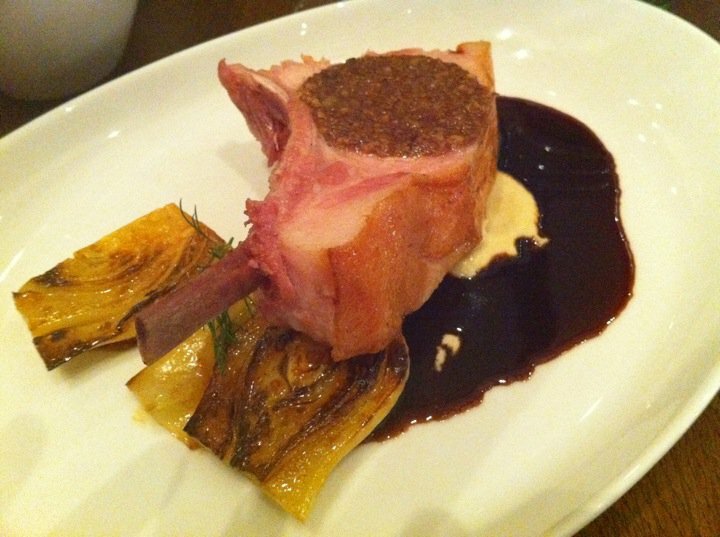 Rotisserie pork, fennel, pork jus. I doubt PM24 will ever receive a complaint in regards to portion sizes. The pork shown above is about the size of my head, and anyone who orders the chicken gets half a chicken with rotisserie vegetables. It’s any wonder people get to dessert, but it would be pretty hard to resist when you see other tables getting desserts like this. 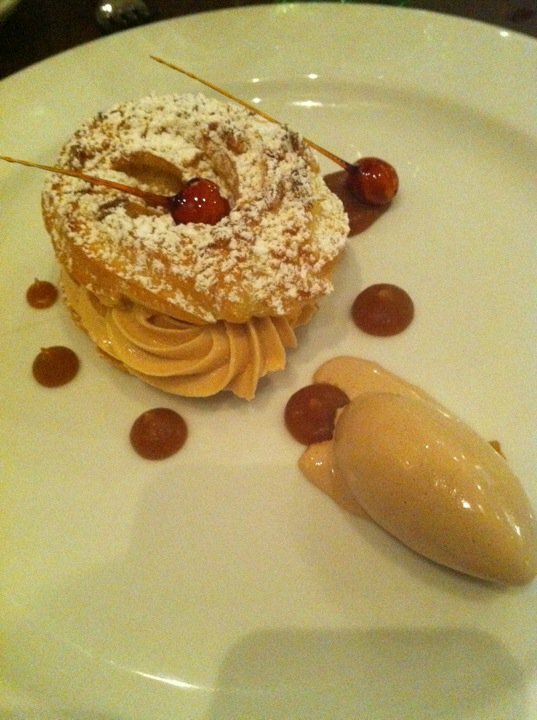 Paris brest (choux pastry, hazelnut praline creme patisserie, sauce caramel, caramel hazelnuts, praline ice-cream). The desserts are traditional French. Classic French desserts are commonplace among many restaurants, and to stand out it means doing the little things right. Take for example the creme brulee. 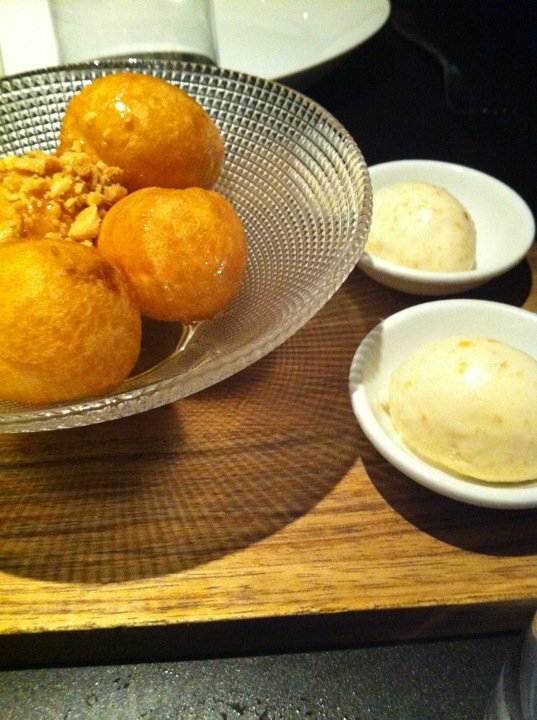 PM24 serves it in a shallow dish with a big surface area (which means more caramel on top) and the pastry chef sprays the top with alcohol, which allows the front of house member to set the dessert on fire at the table. I would order a flaming dessert every time! One of the quintessential parts of any French kitchen is the stocks and sauces. To allow for big volumes of sauce to be made, a brat pan is used. It works basically like a massive square saucepan, and is stirred with a metal implement which I’m sure was once used as an oar in a canoe. When tightening a wingnut, righty=tighty, lefty=loosey. This might seem silly, but I wish I’d known it before I broke the wingnut on the thermoregulator. It took me a buttload of phone calls to track someone down who sold replacement parts in Melbourne. Sauce section is fun, difficult, and bloody hot when you are standing in front of a rotisserie/ovens/stove for a long time. PM24 has shown me a different way of looking a rotisserie. Not a device often used in top restaurants, but is used expertly to create really beautiful food. Making 900 suckling pig croquettes is a cruel thing to do, as they are one of the tastiest morsels of food I can imagine. I’m still kicking myself I didn’t steal a hundred or two and sell them on the black market. They would have been snapped up like hotcakes. Or hot croquettes. 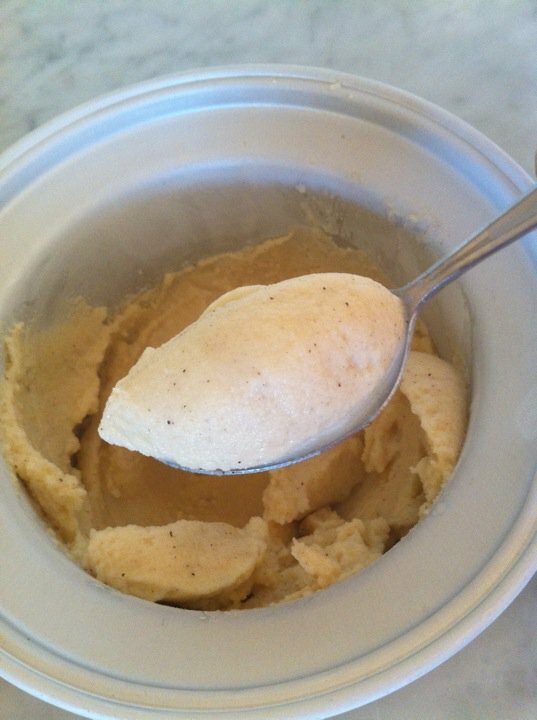 Just a quick post guys- just wanted to share this brown butter ice-cream I just made. It is possibly my new favourite ice cream. First, make the brown butter. In a small saucepan melt butter, then continue to cook until brown but not black. The butter should smell like roasted hazelnuts when at the correct beurre noisette stage. Whisk the egg yolks and castor sugar together in a large heat proof bowl. Bring milk to a simmer in a medium saucepan. Pour onto egg yolks, whisk until combined then transfer back to saucepan. Cook mixture until it reaches 82C on a thermometer, or until it thickens and coats the back of a spoon. Strain mixture through a fine mesh sieve, and cook rapidly over ice. Stir in butter while milk and egg mixture (custard) is still warm. Churn in an ice-cream machine. If you don’t have an ice-cream machine you can freeze the mixture, periodically removing and beating with electric beaters, but if you love ice-cream like I do, a machine is money well spent. I’ll post again soon with some more of my adventures. Thank you everyone for all the amazing support! Coming into the festive season I thought it would be great if those of you reading this shared some favourite recipes/ food stories for this time of year. Unsurprsingly I love Christmas! Not only is it a a great chance to rally all your loved ones together, but there’s always a license to eat as much as you want. I remember as a child not being able to eat the Christmas pudding one year, as it was so soaked in brandy because it wouldn’t light! Last year, I decided to cook a whole snapper for the family. Upon getting the snapper delivered though, I realized that I had gotten a little carried away with the weight I requested. It was far too big for my oven, and so it had to be filleted before I could cook it! My family is also always keen for a game of backyard cricket or boule, with a glass of punch or beer never too far away. Everyone has their different traditions at this time of the year. Something my family has done for as long as I can remember is having pancakes on Christmas morning, before the inevitable feast that was to follow for lunch. I love pancakes, they’re easy, you can make the batter in advance, and most importantly it gives you an excuse to have ice cream with your breakfast! My recipe results in fluffy, thick pancakes (well, hotcakes more so) as I prefer these to the thinner crepe version. Lemon juice and sugar, banana, maple syrup and icecream, strawberries and cream are some the combinations I am partial to. Make a well with the flour in a large bowl. Whisk together milk, eggs and sugar, and pour into the well. Using a whisk, incorporate the dry and wet ingredients to a smooth batter. Cover with clingfilm and transfer to the fridge until ready to cook. I often do this Christmas eve so I can just wake up and cook them in the morning. Even if you make them in the morning it is a good idea to rest the batter for half an hour in the fridge before cooking to relax the gluten in the flour. I have a great non-stick pan at home, and so my little trick is to actually cook the pancakes in a dry pan, that is, no butter or oil whatsoever. I find this gives the a really even colour, but if you don’t have a good non stick pan I would cook them in a little butter. Another favourite amongst my family has always been having a pavlova on Christmas day. I am a fan of Donna Hay’s recipe, as I find it gives a really pleasing result and gives that nice combination of crisp outer shell with a softer and more marshamallowy interior. Is marshmallowy a word? Probably not. A pavlova is very much a blank canvas and you can cover it in whatever you want. I can’t say I’m a fan of chocolate on a pav, as they are sweet enough. For me fruit is the way to go, and acidic fruit at that. I think a really simple vanilla Chantilly cream with halved pitted cherries is delicious, and screams of Christmas. 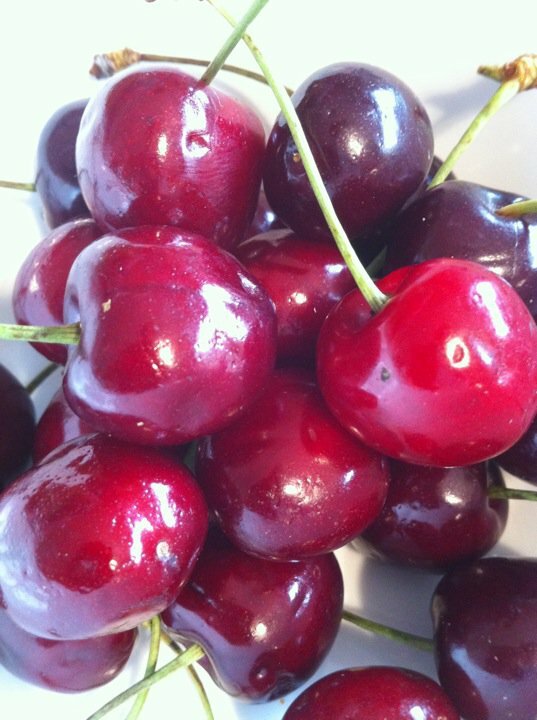 You don’t see cherries around much during the year (well, not good cherries) and so my family would not eat them. Come December though, we would go crazy and buy them in bulk and snack on them constantly. My Aunty, who makes the best pav in the world (no bias) uses kiwi fruit to cover hers, but I think New Zealand already have a fairly solid claim on its invention, so I think using kiwi fruit is admitting defeat! Passionfruit and berries also work well. 10 points if anyone can make out any of the cookbooks on the shelf in the photo above! Preheat oven to 150 degrees Celsius. 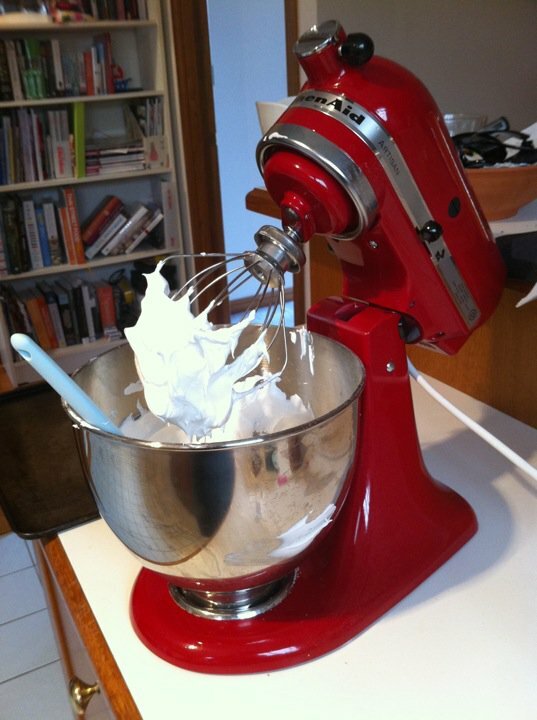 Place egg whites in the bowl of an electric mixer and beat until soft peaks form. Gradually add sugar, beating well until the mixture is glossy. Sift the cornflour over the egg white mix and fold through with the vinegar. Pile the meringue mixture into an 18cm round on a baking tray lined with non-stick baking paper. Place in the oven, reduce temperature to 120 degrees Celsius and cook for one hour. Turn the oven off and allow the meringue to cool in the oven. To serve, top with whipped cream and fruit and serve immediately. Other than continuing work at Maha this week, I also spent a morning with George as he worked on an upcoming book. It was lots of fun, and best of all I got to eat the leftover food. We shot 5 dishes that morning, and so I had everything from a rabbit and mushroom braise to a fruit parfait for breakfast. A good way to start the day. 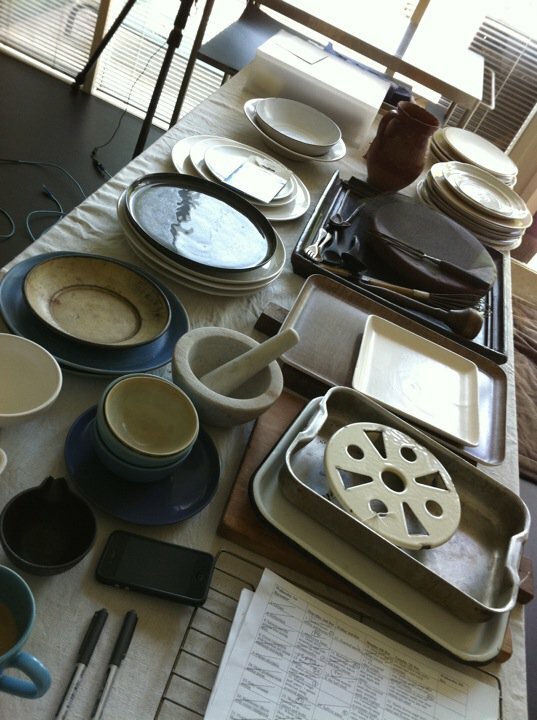 It was interesting to see the array of props the food stylist had. Please share a story or a recipe to suit this festive season! Writing a cookbook would be a really fun process, and plus you get to eat all the fantastic food afterwards! The only downside, is that like Masterchef, the food is cold by the time you get to enjoy it! 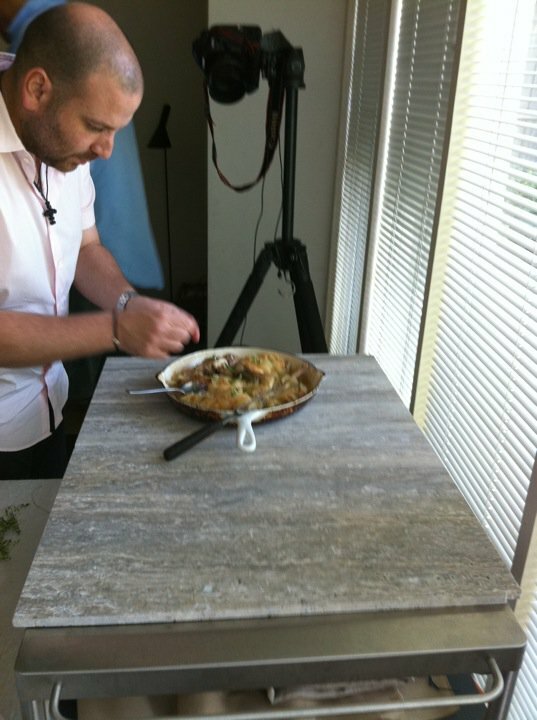 Something I learnt about myself (but have always known somewhat) is that I love teaching people to cook. Even little things like giving the kitchen hand at work my knife and showing him how to correctly chiffonade the herbs was really satisfying (he hopes to be a chef one day). I just need to find a way to channel this passion into something positive! Everything tastes better when you are wearing a ridiculous paper hat from a bon-bon. Or maybe the food at Christmas time is just awesome. My culinary adventure continued this week, venturing a little further down Flinders Street in Melbourne, down a side street to Shane Delia’s middle-eastern restaurant, Maha. I thought I’d start by running through some of my favourite dishes on the menu. 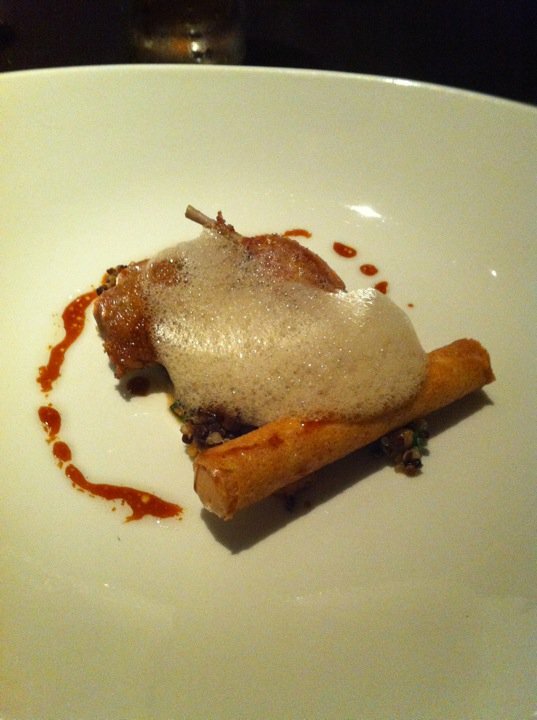 Roast quail, cocoa nibs, candied walnuts and quinoa, chicken parfait bastilla, coffee and cardamon air. 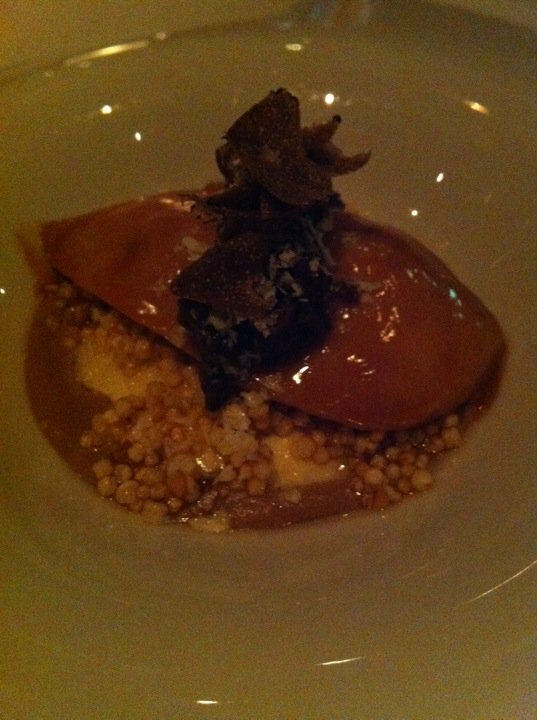 I like the combination of the cocoa and coffee with the quail, which is not something I would have thought of. The soft chicken parfait contrasted by the crunch of its brik pastry shell is heavenly. I love a well-made chicken liver parfait, and this one is particularly delicious. I endeavour to steal the parfait recipe before I leave! Oyster katifi, puffed and bbq corn salad, smoked and salted almonds, tomato and sumac foam. I don’t want to like this dish, as I fundamentally disagree with the cooking of oysters, but the contrast of texture between oyster and pastry makes it pretty hard to resist! Sumac is a spice I hadn’t used much up until recently but now I love it. Compliments the tomato nicely in this dish, but is used at The Press Club to flavour strawberries in one of the desserts. Anyone who has eaten at Maha will almost certainly have had these donuts. I was silly enough to eat one almost straight out of the deep fryer, and burnt the crap out of my tongue on the molten turkish delight contained within. 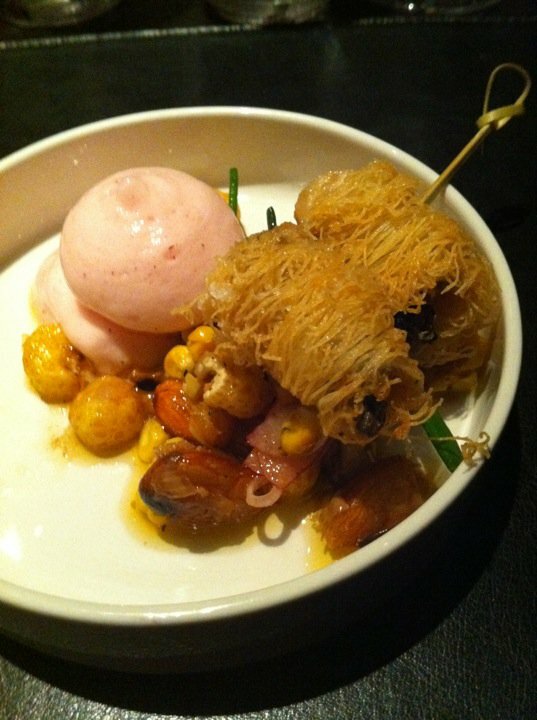 In fact, they are so popular that the other desserts on the menu rarely get ordered. It’s actually a bit of a shame, as there are some cracking desserts on the menu, my favourite being the sweet corn cream with salted caramel and nut butter ice-cream. It was ordered too scarcely for me to get a photo of it! It would also be criminal of me to not put up the photos of Quay I took when I went on the weekend. It was my first visit to the 3-hatted, 27th best restaurant in the world (according to S.Pellegrino’s top 50 restaurant awards) The restaurant also won the Australian Gourmet Traveller Restaurant Awards 2010 and The Sydney Morning Herald Good Food Guide 2010. After recently acquiring Peter Gilmore’s Quay cookbook, I was excited to say the least. Simply put, the food was inspiring. 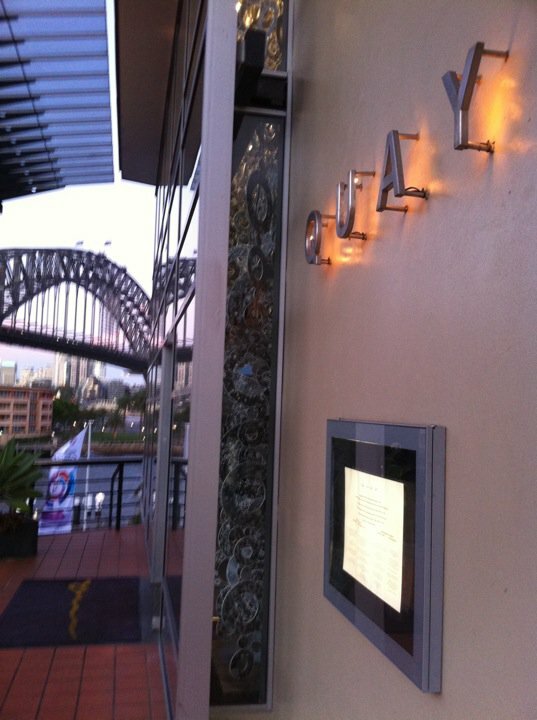 Quay is the pinnacle of fine dining in Australia, and along with the views of the harbour bridge and opera house, it made for a very memorable experience. I have met chef Peter Gilmore a few times, and it’s very pleasing to know that he is a very down-to-earth, friendly guy. I think sometimes people assume that top chefs have big egos or are arrogant, and this couldn’t be further from the truth here. Adam and I had to re-create Peter’s ‘snow egg’ dessert in the finale of Masterchef, and so I think Quay will always be pretty special to me as it was involved in a big part of my life. 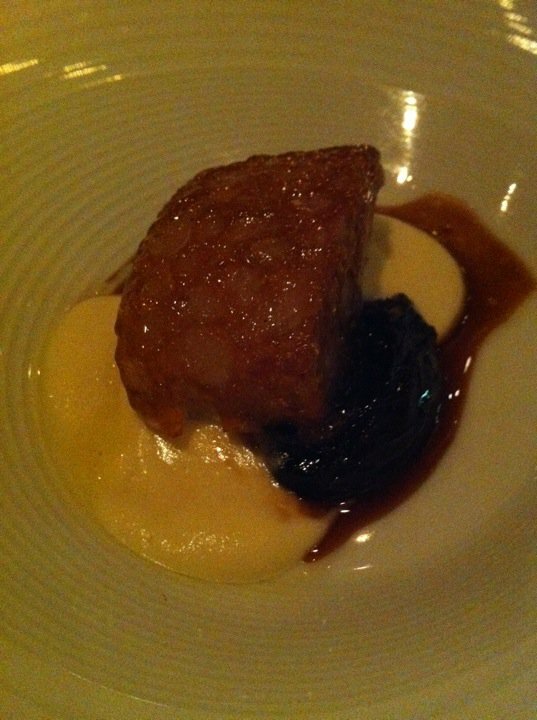 My photos do not do the food justice, as the dim lighting means that the dishes all look rather dark and brown. I hope you will get the gist though. Enough talk, I’ll let the food speak for itself! I could write about Quay for hours, but I think it may be best if I don’t add too much text to this already rather lengthy post. It’s fun to experiment with flavour combinations that you wouldn’t always think are going to work. 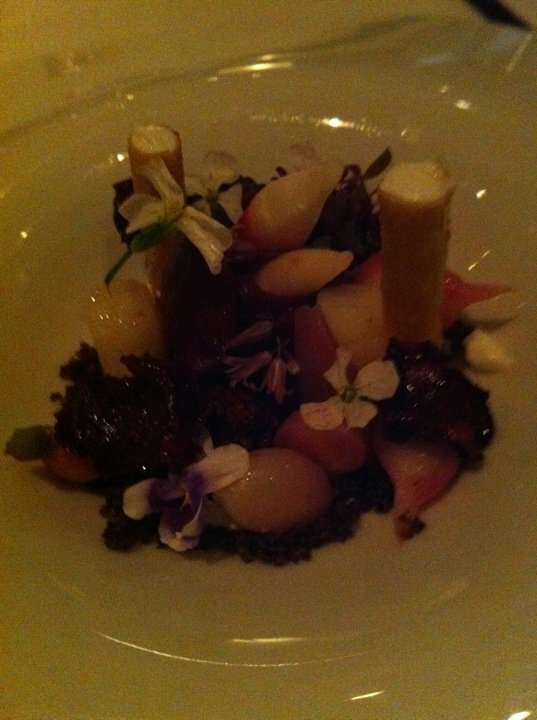 As shown in my Maha photos, I think the coffee and quail goes well, and as mentioned sumac and strawberries is delicious. If you are going to treat yourself to a meal at a top restaurant, I think it’s worth doing it properly and getting the degustation, so you can sample the best of what the kitchen has to offer. It is usually the more expensive way to dine, but I would rather spend more money and go out less often. The same applies with food you buy too- I would rather buy 100g of a beautiful artisan triple cream brie than 500g of supermarket brie for the same money. Chocolate is another example, if I had $10 to spend I would get the best quality stuff and have a little bit rather than a kilogram of poor quality chocolate. Don’t burn your tongue on piping hot donuts. Not only does it hurt, it also makes tasting dishes for seasoning slightly more of a challenge! This week I spent a service at the all-dessert café Rosamond, run by pastry chef Pierre Roelofs. I went in with big expectations, not only because I had tackled the dessert degustation twice previously, but Pierre has a resume to die for. He spent fourteen years honing his craft in Europe, spending time at three Michelin-starred restaurants, including Heston Blumenthal’s The Fat Duck. Needless to say I wasn’t disappointed. I arrived, knowing that although I had eaten there recently, I would not have seen any of the dishes I would be making tonight, as the menu is brand new every week. 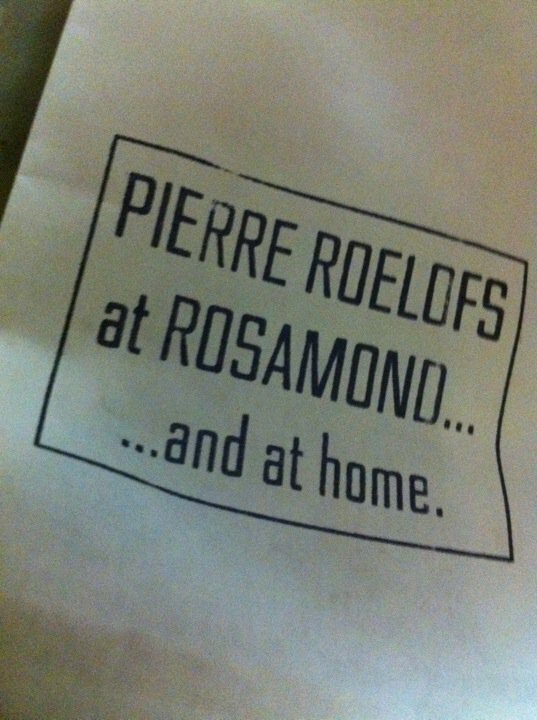 Pierre has been at Rosamond for 33 weeks now, which means 33 entirely different menus, with four desserts each. There are four desserts on each menu, so 132 different desserts in less than a year, all of high quality, with no signs of slowing down. When you see how complex each dessert is, you may begin to understand why Pierre is one of the best pastry chefs going around. The first dish I was shown to plate up was one of the restaurant’s signatures, the test tube (containing a different combination each week). It’s a little amuse bouche, and is a fun way to start the evening. Pear puree, tea jelly, pop rocks and vanilla gel (I forgot to take a photo so the picture is from a couple weeks ago when I ate there and is in fact chocolate). 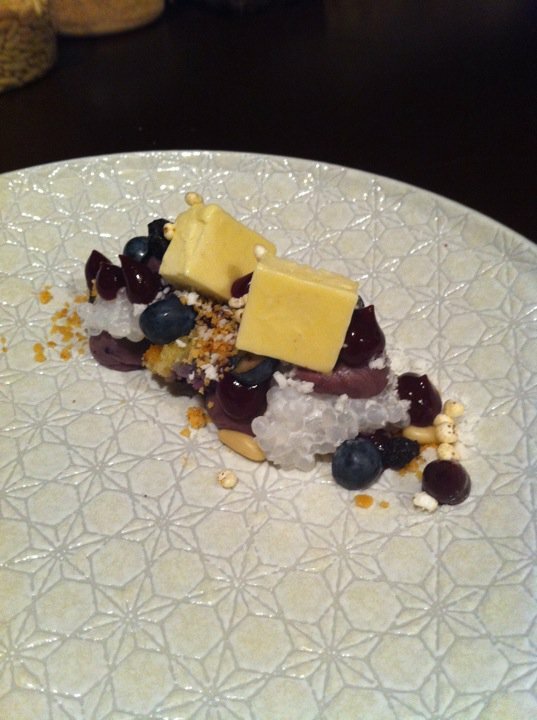 The second of the four desserts tonight was a good combination of classic techniques (blueberry frangipan) and modern ones (blueberry gel). Pierre mentioned that many good pastry chefs turn their noses up at some classic techniques (crème pat) and whip out the molecular gastronomy kit at every chance. 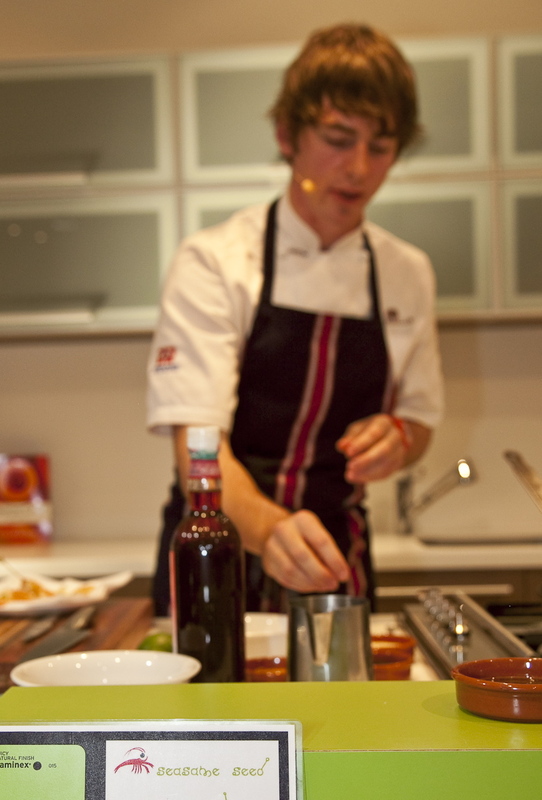 Food is all about taste though, and Pierre is not above any technique in order to create the perfect flavour balance. 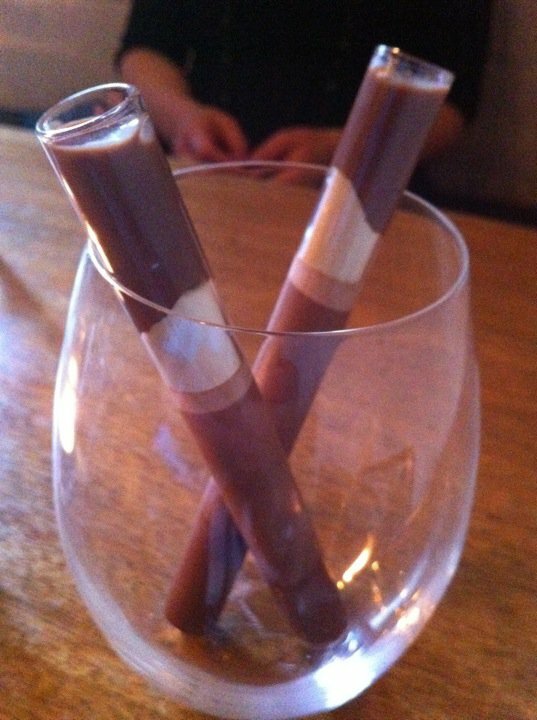 The third course is on the menu as “the one in the middle” and is served in a glass. Actually, that is a bit of a lie as there is no menu as such. Even if there was, I’m not sure what you would call these dishes as they have quite a few elements! This makes it quite interesting to eat, as you continue to find new elements to the dish as you delve deeper into the glass. 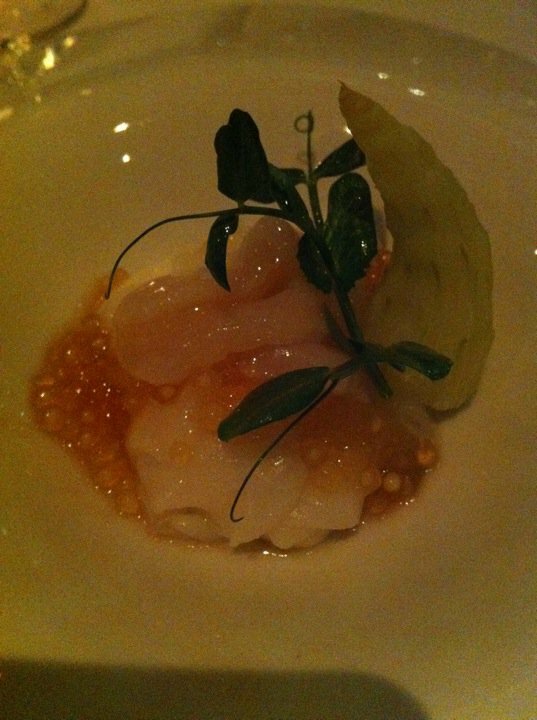 I think this dish is an excellent example of how important it is to not only balance flavours, but textures too. 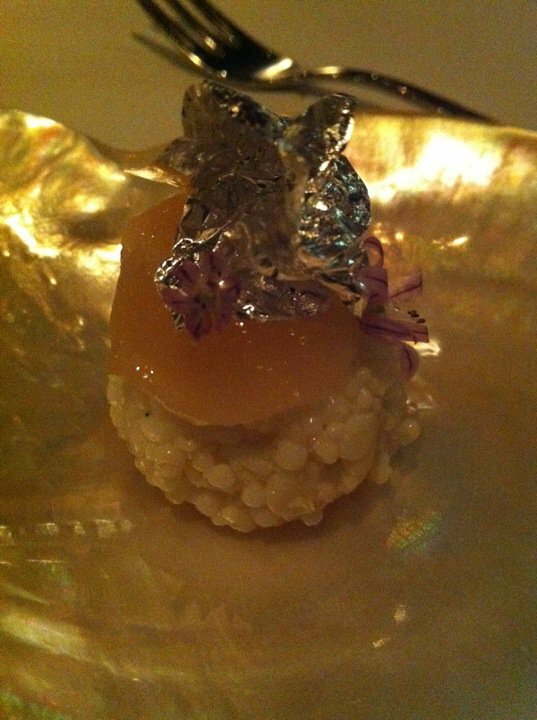 The fourth and final dish of the night was a stunning little dome, and had some rather unusual, but delicious elements. It’s not that often you see polenta used in a dessert, and I’d certainly never heard of freeze-dried maple syrup before! Agar for gels: 0.9 grams per 100g liquid (eg. Fruit puree) is the general rule, but sometimes a bit less if the liquid is particularly viscous. Agar needs a certain amount of liquid to work properly. If you make something with agar and it is grainy, it may be because there was not enough moisture for the agar. It is really strong in thin layers, but can become brittle if you set it thick. The liquid you wish to gel and the agar should start from cold and come up to a rolling boil as quickly as possible, whisking. As soon as it is at a rolling boil, remove from heat and cool as quickly as possible. Allow to cool completely and set, then puree in a blender to a gel. 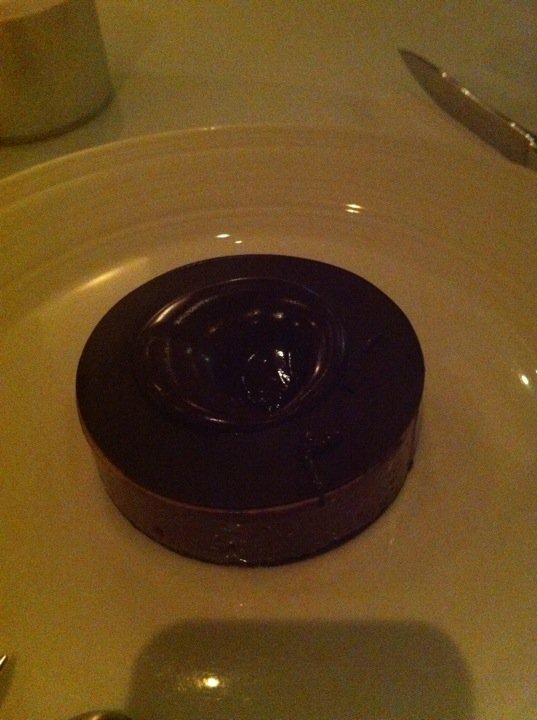 Pierre was kind enough to give me one of his take-home desserts. The dry mix in a packet is brought to the boil with a little milk, and turns to a finished pudding in minutes! Very clever indeed. 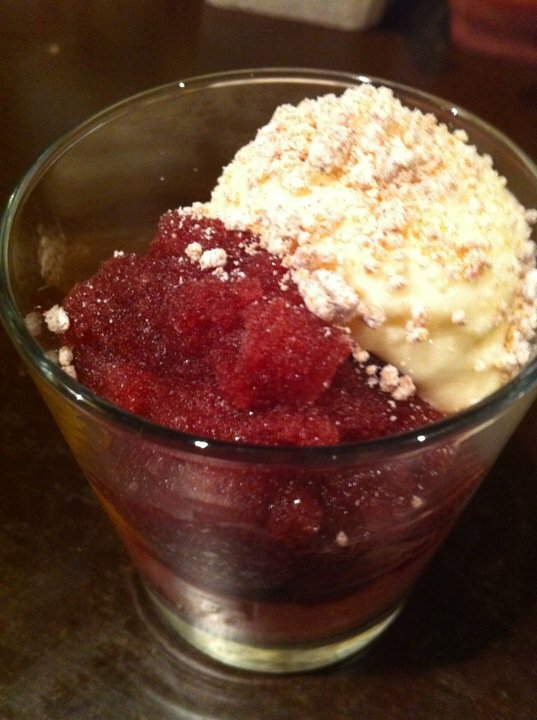 There is gellan gum in the mixture which allows it to thicken to a pudding consistency so quickly. You should be able to justify and validate everything you do. Why is that element on the plate? How is that element made? Don’t use an ingredient without knowing where it comes from and how it is made. 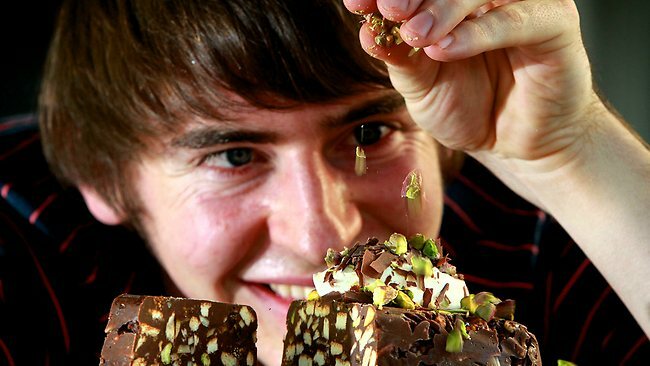 Pierre’s example was the pop rocks that we were plating up. I had no idea how pop rocks are made. For the record, little pellets of really hot sugar are fired in a high-pressure environment, and then are cooled very quickly. The high-pressure means that they pop rocks trap little pockets of CO2 as they solidify. When you eat them, (or if they come in contact with liquid) they sugar melts, releasing the pockets of CO2, hence the ‘pop’. Work as neat and tidy as you possibly can and you’ll be the best chef you can be. I have been told this by many respected chefs, so I figure there is something in this.